Emmet County does allow research into its vital records at the County Clerk facility, however their hours are limited, being open on Tuesdays and Thursdays from 2:00PM until 4:00PM only, and only a single researcher is permitted on the index computer at a time. All of their vital records are available from 1867 to the present, except for divorce records which are available for all of the 1800s. For further questions or to inquire as to availability, those interested can email the County Clerk at gmartin@co.emmet.mi.us. 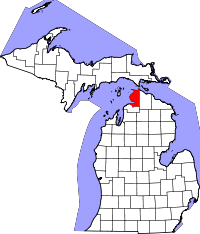 Along with only three other places in the world, Emmet County is the native home to the Hungerford's crawling water beetle, one of the most endangered species in the world. The small area the beetles are found is studied and protected by the University of Michigan Biological Station. Much of Emmet borders Lake Michigan, and the population is relatively small.